Good morning again everyone on this Thursday morning. It's time again for a new challenge at CRAFT Challenge this week and it is number 40 already. This week we are looking forward to Mother's Day later this month. 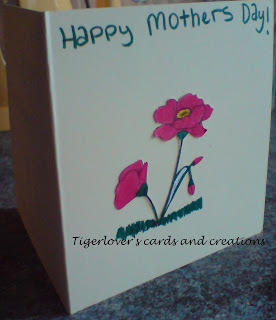 Our brief therefore is to create a Mother's Day project or one using flowers for those of us that don't do Mother's Day cards. Our sponsor this week is our very own Claire from Shop Handmade and she is donating a lovely collection of crafting goodies, you will be able to see those later on in this post. And here is my card for this week. I made this one at my birthday party last weekend. We went to watch a movie in the morning, then had pancakes, did some fun stuff together, made candles and some cards. We had a great time. 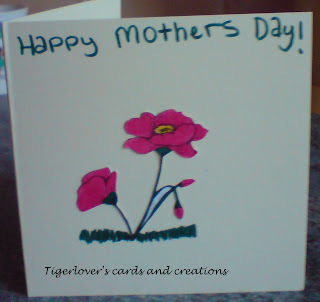 I made this card for my Mum and have already given it to her. She'd already seen it anyway. 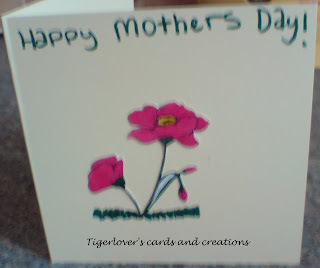 For this card I used a digistamp from our very own Magda. I'm sure you'll agree, a lovely prize. Thank you for looking, all comments very welcome and much appreciated. Have a good weekend everyone! HI Jo, this is Nina from TMITA http://theresmagicintheair.blogspot.com/ not sure why the downloading is not working, I have reloaded a new link so give it a try, if you continue to have problems, email me and I will forward the image to you through an email. :O) hope you play along with us this week.. we would love to have you! Great job! I love the white space on this card. It looks great with the vibrant flower. If you are interested, my 8-yr old daughter has a craft blog HERE.